The United Kingdom’s Registered Traveller program allows regular UK visitors to bypass the queues at passport control – including the often-lengthy lines at London’s Heathrow Airport after those long flights from Australia – in favour of whisking through the UK and EU lanes like a local, without even completing a landing card. However, membership in the program isn’t cheap, setting you back $122 in the first year alone, with extra fees charged when getting a new passport, travelling with children or to renew your membership after 12 months. So, is it worth it? Here’s what you need to know. When Australian travellers enter the United Kingdom, they normally need to join the ‘other passports’ queue at the border. Because it’s the same line used by most other foreigners from all over the world, lines can be lengthy: and especially so at busy airports like Heathrow. But with a Registered Traveller membership, globetrotters are instead granted access to the lines otherwise reserved for UK and EU citizens, along with the ePassport gates for automated clearance (similar to Australia’s SmartGate) – both of which tend to be faster, getting you out of the airport sooner. Once enrolled, this works when arriving internationally at London’s Heathrow, Gatwick, City, Luton, Standsted and Southend airports, along with airports in Birmingham, Bristol, Cardiff, East Midlands, Glasgow and Manchester, and at the Eurostar terminals in Brussels, Lille and Paris when bound for the UK. This also removes the requirement to complete a UK landing card, saving even more time. To join the Registered Traveller scheme, you’ll need to hold a UK visa or entry clearance, or have visited the UK at least four times in the 24 months immediately prior to submitting your application for business, general/tourism, academic travel or transit travel (where you crossed the UK border, as opposed to remaining airside). You can also apply if you’ve visited the UK for entertainment or sports purposes, have a child in a UK school, are a member of a diplomatic mission or are a medical visitor, although the four-visits-within-24-months rule still applies. Further, you’ll only be eligible if you have a passport issued by certain countries – this includes Australia, New Zealand, Hong Kong, Singapore, Canada, the United States and more: for a full list, see here on the UK Government website – and you also need to be aged 18 years or over. If you’ve travelled to the UK three times in the past 24 months as an Australian passport holder, you’ll only be able to apply for Registered Traveller after completing your fourth visit: you can’t apply and use visit #4 to both finalise your enrolment and satisfy this rule. There are separate policies for travelling with children and attaching them to your membership, but we’ll let you browse the Registered Traveller website for those details. If you think you meet the requirements, you can apply through that Registered Traveller website, by providing the information requested and answering questions about your travel history and any criminal convictions you may have. 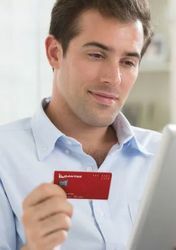 You’ll need to have your passport handy, and a major credit card to pay the £70 (A$122) application fee, which covers up to 12 months of initial membership from the day you first lodge your application. 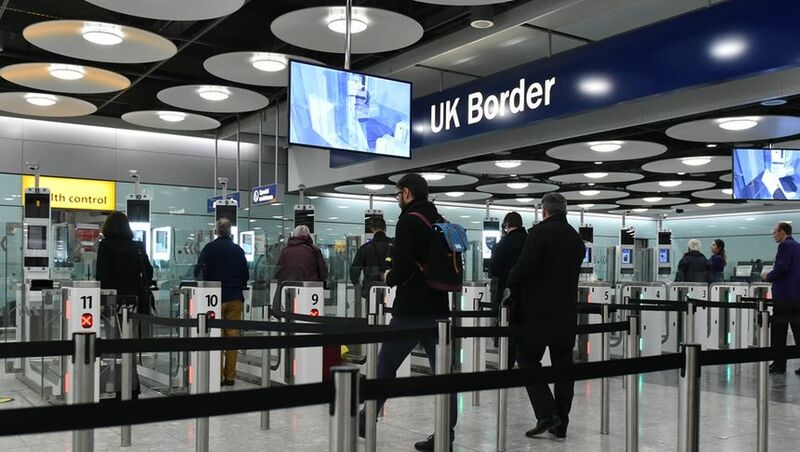 Once submitted, it can take the UK Border Force up to 10 working days to process your application, given the need to complete background and immigration checks, although in my experience, it took only five working days to gain ‘provisional acceptance’, as notified by email. 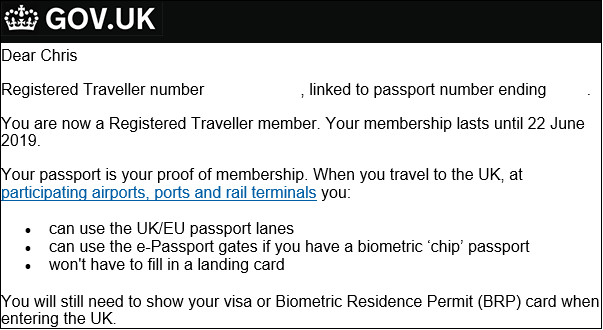 When you receive this, it means the UK’s background checks are all complete, but you’re not finished yet: you still need to complete your membership enrolment in person, by going through the ‘normal’ UK passport lane one last time and filling out a landing card, as you usually would. When you arrive at the passport desks, tell the officer that you have a pending Registered Traveller membership and request they complete the process – typically, they’ll ask you a few extra questions than normal and make their determination. If everything is clear, you’ll receive either a Registered Traveller membership card or a sticker on the back of your passport, which doesn’t actually ‘do’ anything, but can help indicate to airport staff that you are in the correct passport channel if challenged: most Australian passport holders can’t use the UK/EU lines, after all – this is a special perk unique to Registered Traveller. In my experience though, there’s one more step before your passport will become active in the ePassport gates as part of the Registered Traveller scheme, and it’s this: you need to wait receive a confirmation email from the UK Home Office that your membership has been finalised, which generally comes about 48 hours after crossing the UK border when your enrolment was completed. That wouldn’t be an issue for most travellers who probably wouldn’t be re-entering the UK within 48 hours of their first entry, but with a hectic schedule calling for a day trip to Brussels the day after I arrived in the UK, returning to London that evening, I found my passport not working in the ePassport lanes at Heathrow after touching down again. Fortunately, Border Force staff manning the nearly UK/EU passport lane were most obliging in processing me through as they could see my Registered Traveller membership in their system, but it’s something to keep in mind if you’ll be darting back and forward from the UK during your own travels. Before that date, you’ll have the option of renewing your membership online for another year at a reduced cost of £50 (A$87) – but if you let it lapse, you’ll have to go back to using the regular, ‘other passports’ lane like everybody else, so mark that date in your diary! If you get a new passport during your membership year, such as because yours was expiring, was filled with stamps or was lost or stolen, you’ll also need to update your passport details for Registered Traveller membership at a fee of £20 (A$35), to continue using the UK/EU passport lanes. This fee is in addition to the amount paid up-front or to renew your membership, but if unless your passport matches your Registered Traveller profile, you’ll also have to use the ‘other passports’ line like everybody else. Knowing that my passport would soon be up for renewal, I asked the Border Force officer who completed my enrolment for an extra ‘Registered Traveller’ sticker to take with me and use after I'd renewed my passport, and they were happy to provide one, given the ‘switcheroo’ is done entirely through the Registered Traveller website, which otherwise gives you no sticker or card to flash if needed. Overall, the UK Registered Traveller scheme is a time-saving initiative for frequent visitors to London and the United Kingdom – particularly when even the ‘fast track’ passport line at Heathrow can take an hour or more to clear – but with high initial and ongoing costs paired with a complex and lengthy application and approval process, you’d need to be visiting the UK very regularly to get your money’s worth. It's worth the cost. I've never waited more than a few minutes (if that) to get through security at Heathrow, Gatwick, Stansted or London City, whereas in comparison the "non EU" passport line can be brutal. What are the requirements when it's time to renew membership of the Registered Traveller program? Does it again require 4 entries to the UK within the previous 24 months prior to renewal, or is it simply the payment of a further fee? Hi Phil, the UK Government doesn't make this clear - but I daresay if you haven't visited four times in the last 24 months (that's just two visits per year), you'd essentially be paying A$40+ for every time you use the UK/EU lane, which probably wouldn't be worth it. My recent experience with the Registered Traveller program has been wonderful. Forget those 90 minute queues at LHR T3, one just heads to one of the 20 odd e-gates and there are no queues there at all. You're through in about 30 seconds. As Chris mentioned above, even the FastTrack queues can be slow. My wife recently arrived at LHR T5 and the so-called FastTrack queue took 50 minutes. Meanwhile I was waiting at the luggage carousel. Neither of us were impressed at all. I wish China would offer something like this! The only thing that really works as a fast-track in China is the APEC Business Travel Card - otherwise, not even first class passengers get a priority line! Administration nightmare- what genius thought that up? HKG requires three visits in one year for a barcode on your passport to enter like a local and they action it in about FIVE minutes on your third entry at the airport. UK immigration really aren't on the same planet are they? Actually since last year Hong Kong has been signing up Aussie passport holders without the previous three-visit requirement, and there's no more barcode as the machine just reads the passport chip: the change was part of a reciprocal deal with Australian authorities as Hong Kong passport holders can now use our SmartGates on arrival, so the HK authorities now allow Australians to do the same, but just require enrolment as a photo and fingerprint need to be kept on file for the system to work. Hi Chris, Appreciate if you or other ABT's could share some more details on the Hong Kong enrolment procedure for Australian passport holders.... and how the system works? Hi aviatorpj, we wrote an article on this last year, not long after the requirements were made easier for Aussies. It is a ludicrously over complicated process, as Geoffair quite rightly says. However it is definitely worth it. My wife has an Australian Passport and the difference in the queuing line is significant (especially on the one occasion when she used the normal line and I used the e-gates, given I have a UK Passport). It's worth it for her as she does a lot of travelling to the UK (9 trips last year) so cost is minimal on a 'per visit' basis. However even if I only just met the bare minimum I think it would be worth having, queues at Heathrow especially can be outrageous. One other point in that - the last couple of times, for various reasons, we have ended up flying into Gatwick. I would say that the immigration process there was a significant improvement on the scrum you often encounter at Heathrow. This is my second year of using the UK Registered Traveller system and it is worth it. I received an e-mail reminder when it was time to renew and all I had to was pay, there didn't seem any requirement to maintain a certain level of travel. I have used it at LHR and MAN without a problems although I find having the card out avoids lots of attempts at redirection from UK Border Staff. I never received the offer of a sticker for my passport (like ChrisCh has). Thanks for the reminder about passport renewal. I will need to renew mine in about a year from now. At this stage I will keep renewing it as I am likely to visit at least a couple of times a year. I think the sticker is new: when I received mine they had a big sheet of them tucked away on their desk. Ourmanin you holding a UK passport enables your wife to accompany you through UK passport control. Of course if shes alone she cant have this perk. We recently lived in the UK so travelled through various UK airports at least 25 times and it was great for me to tailgate my UK born husband in the queue. I only found this out when an officer asked me if i was alone, and said in future if you travel with him go together. Havent looked back. Still jealous my hubby and our daughters hold EU passport. good one - that's interesting as it hasn't been our experience, I am specifically talking about using the e-gates as opposed to queuing up to see an immigration officer. We have gone together in the same line for that, but without the Registered Traveller authorisation for your passport my understanding is that you can't use the e-gates with an Australian Passport, whether tor not you are accompanying your spouse. Just another tax on visitors to the UK, not exactly welcoming. Most passports have chips and you'd think UK can get into the real world system as HKG and Australia have? FREE procedure at HKG airport is very simple, stated above, just a photo and fingerprint for their reader - also you can't commit crimes with that fingerprint because its on all government records! HKG gives you a slip stating you are allowed three months stay and not allowed to work since you are a tourist. I was on the pilot scheme when it was a first introduced and there were issues in the beginning but its great now. Crosscourt, I presume that you've been in the program for a couple of years now. Can you tell us what the renewal requirements are? Does it again require 4 entries to the UK within the previous 24 months prior to renewal, or is it simply the payment of a further fee? I've been in the program every year since the pilot scheme. I have never had to prove again the number of times I have entered the UK, although that would not be an issue to do. I have been sent an email for renewal without any questions and I have followed the instructions and renewed. Pretty simply. I will add that the first renewal had some technical problems with payment going through but I think that may have had something to do with the system. It's been fine since. Sometimes the machines can be temperamental and in that case just go (cut in) to the passport officer and tell him/her the machine didn't work and he stamps your passport, still no need to fill in the arrival card. There are service people always at the electronic gates. My passport is running out of page, and I am renewing it soon. Can I apply for Registered Traveler using the new passport, or do I need to use the old passport (seeing how the "records" of my visits to UK in the past 24 months would be associated with the old passport)? Or, will there be a field on the application form that asks information on any old passport so they can use those records as well? Trying to see if I can avoid paying the £20 to change the record to the new passport. Comment on "Skip those London passport queues with a UK Registered Traveller card"